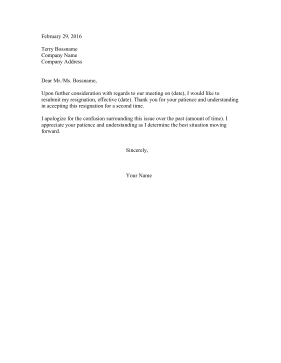 Although it's awkward to submit a resignation for the second time, this brief letter does it smoothly and succinctly. Upon further consideration with regards to our meeting on (date), I would like to resubmit my resignation, effective (date). Thank you for your patience and understanding in accepting this resignation for a second time. I apologize for the confusion surrounding this issue over the past (amount of time). I appreciate your patience and understanding as I determine the best situation moving forward.